The Trenton, NC area has had 5 reports of on-the-ground hail by trained spotters, and has been under severe weather warnings 12 times during the past 12 months. 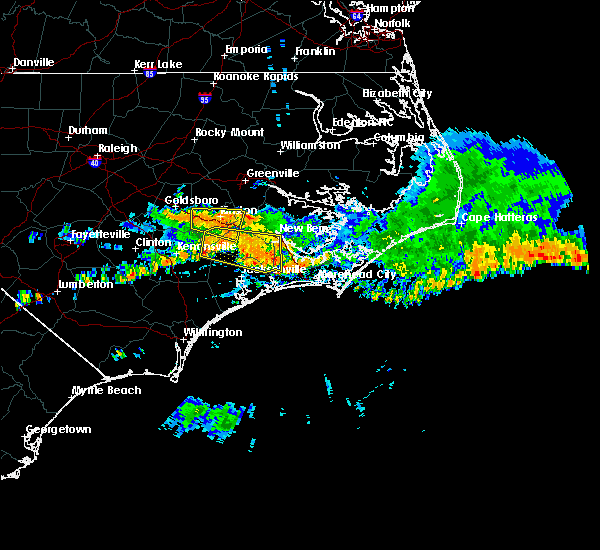 Doppler radar has detected hail at or near Trenton, NC on 30 occasions, including 2 occasions during the past year. 4/19/2019 7:20 PM EDT At 719 pm edt, severe thunderstorms were located along a line extending from 10 miles north of tarboro to near stokes, moving north at 65 mph (radar indicated). Hazards include 60 mph wind gusts. Expect damage to roofs, siding, and trees. locations impacted include, jacksonville, piney green, swansboro, hubert, maysville, silverdale, kellum, midway park, belgrade, catfish lake, deppe, loco vfd, cove city, pollocksville and trenton. 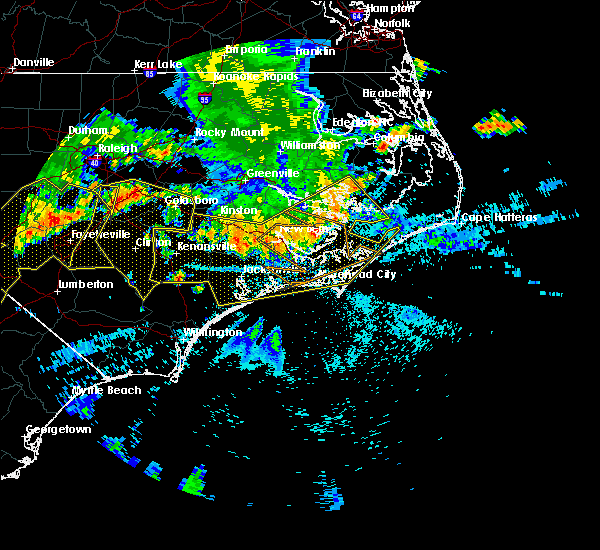 A tornado watch remains in effect until midnight edt for eastern north carolina. 4/19/2019 7:00 PM EDT At 700 pm edt, severe thunderstorms were located along a line extending from 8 miles east of elm city to near calico, moving north at 65 mph (radar indicated). Hazards include 60 mph wind gusts. Expect damage to roofs, siding, and trees. locations impacted include, jacksonville, kinston, new river station, pumpkin center, piney green, half moon, camp lejeune center, swansboro, grifton, phillips crossroads, hubert, snow hill, maysville, silverdale, kellum, midway park, comfort, dawson, belgrade and graingers. 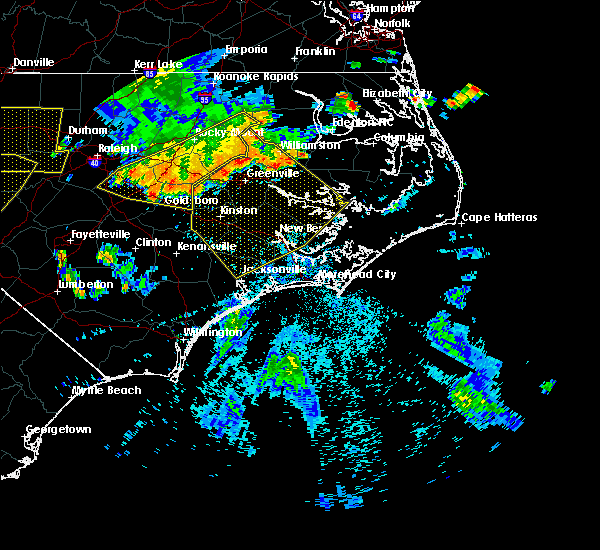 A tornado watch remains in effect until midnight edt for eastern north carolina. 9/14/2018 11:14 PM EDT At 1114 pm edt, a severe thunderstorm capable of producing a tornado was located over cape carteret, or 12 miles southwest of newport, moving northwest at 30 mph (radar indicated rotation). Hazards include tornado. Flying debris will be dangerous to those caught without shelter. mobile homes will be damaged or destroyed. damage to roofs, windows, and vehicles will occur. tree damage is likely. this dangerous storm will be near, peletier around 1120 pm edt. stella, hubert, silverdale and kuhns around 1130 pm edt. belgrade around 1145 pm edt. maysville around 1150 pm edt. Other locations impacted by this tornadic thunderstorm include indian beach, hargetts crossroads, deppe, trenton, loco vfd, pink hill and cedar point. 9/14/2018 10:31 PM EDT At 1031 pm edt, a severe thunderstorm capable of producing a tornado was located near phillips crossroads, or 15 miles south of kinston, moving northwest at 45 mph (radar indicated rotation). Hazards include tornado. Flying debris will be dangerous to those caught without shelter. mobile homes will be damaged or destroyed. damage to roofs, windows, and vehicles will occur. tree damage is likely. this dangerous storm will be near, pleasant hill around 1035 pm edt. 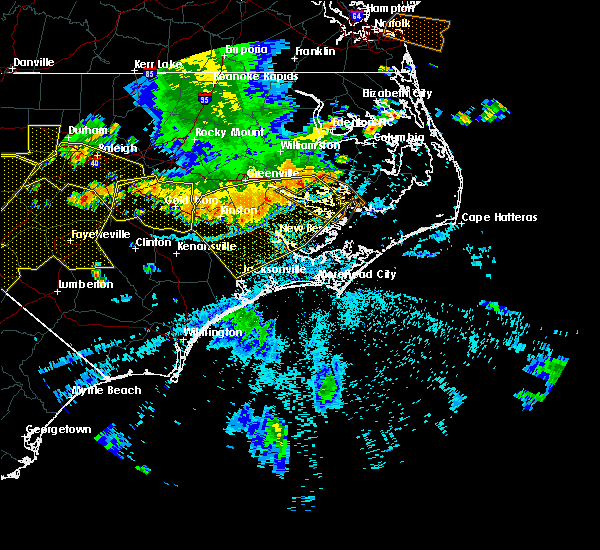 kinston and deep run around 1050 pm edt. albertson around 1055 pm edt. la grange around 1105 pm edt. Other locations impacted by this tornadic thunderstorm include sandy bottom and trenton. 9/14/2018 9:10 PM EDT At 908 pm edt, a severe thunderstorm capable of producing a tornado was located near kuhns, or 11 miles northeast of piney green, moving northwest at 40 mph (radar indicated rotation). Hazards include tornado. Flying debris will be dangerous to those caught without shelter. mobile homes will be damaged or destroyed. damage to roofs, windows, and vehicles will occur. tree damage is likely. this dangerous storm will be near, maysville and belgrade around 915 pm edt. 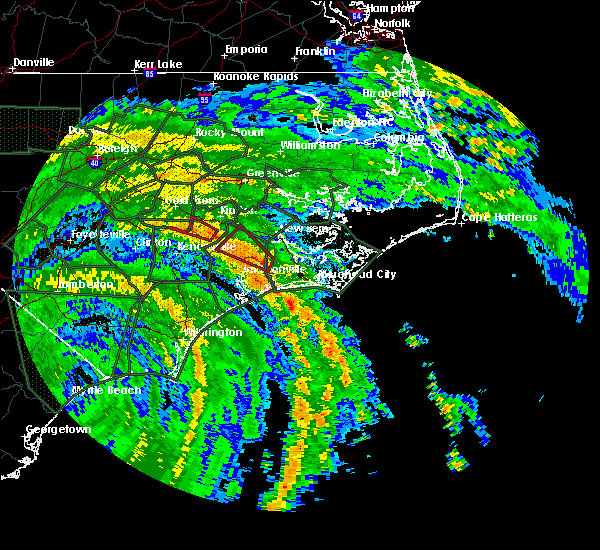 comfort around 940 pm edt. phillips crossroads around 945 pm edt. Other locations impacted by this tornadic thunderstorm include trenton, pollocksville and loco vfd. 9/14/2018 1:58 PM EDT The national weather service in newport has issued a * tornado warning for. jones county in eastern north carolina. 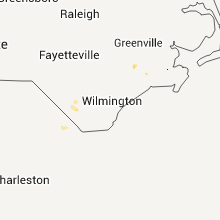 northeastern onslow county in eastern north carolina. until 230 pm edt. At 157 pm edt, a severe thunderstorm capable of producing a tornado. 6/11/2018 2:57 PM EDT At 257 pm edt, a severe thunderstorm was located near maysville, or 13 miles southwest of new bern, moving east at 35 mph (radar indicated). Hazards include 60 mph wind gusts and quarter size hail. Hail damage to vehicles is expected. expect wind damage to roofs, siding, and trees. Locations impacted include, new bern, trent woods, river bend, phillips crossroads, richlands, deep run, maysville, comfort, rhems, belgrade, potters hill, petersburg, pleasant hill, catfish lake, deppe, loco vfd, pollocksville, hargetts crossroads and trenton. 6/11/2018 2:28 PM EDT At 227 pm edt, a severe thunderstorm was located near pleasant hill, or 13 miles north of half moon, moving east at 35 mph (radar indicated). Hazards include 60 mph wind gusts and quarter size hail. Hail damage to vehicles is expected. Expect wind damage to roofs, siding, and trees. 3/1/2018 6:19 PM EST At 619 pm est, severe thunderstorms were located along a line extending from near graingers to near deep run to near wallace, moving east at 60 mph (radar indicated). Hazards include 60 mph wind gusts and penny size hail. Expect damage to roofs, siding, and trees. Locations impacted include, jacksonville, kinston, wallace, half moon, grifton, phillips crossroads, kornegay, rose hill, richlands, beulaville, deep run, catherine lake, cypress creek, comfort, kenansville, fort barnwell, chinquapin, jasper, dawson and potters hill. 3/1/2018 5:56 PM EST At 556 pm est, severe thunderstorms were located along a line extending from near walnut creek to beautancus to 7 miles west of harrells, moving east at 60 mph (radar indicated). Hazards include 60 mph wind gusts and quarter size hail. Hail damage to vehicles is expected. Expect wind damage to roofs, siding, and trees. 6/24/2017 7:33 PM EDT At 732 pm edt, severe thunderstorms were located along a line extending from 8 miles north of richlands to 6 miles northeast of wallace, moving east at 40 mph (radar indicated). Hazards include 60 mph wind gusts and quarter size hail. Hail damage to vehicles is expected. expect wind damage to roofs, siding, and trees. Locations impacted include, jacksonville, half moon, richlands, beulaville, albert j ellis airport, richlands south and trenton. 6/24/2017 7:12 PM EDT At 712 pm edt, severe thunderstorms were located along a line extending from near beulaville to near harrells, moving east at 40 mph (radar indicated). Hazards include 60 mph wind gusts and quarter size hail. Hail damage to vehicles is expected. Expect wind damage to roofs, siding, and trees. 5/31/2017 5:21 PM EDT At 521 pm edt, a severe thunderstorm was located near beulaville, or 14 miles northwest of half moon, moving east at 40 mph (radar indicated). Hazards include 60 mph wind gusts and quarter size hail. Hail damage to vehicles is expected. expect wind damage to roofs, siding, and trees. Locations impacted include, jacksonville, half moon, pumpkin center, piney green, richlands, beulaville, albert j ellis airport, richlands south, pink hill and trenton. 5/31/2017 5:00 PM EDT At 500 pm edt, a severe thunderstorm was located near kenansville, or 11 miles east of warsaw, moving east at 40 mph (radar indicated). Hazards include 60 mph wind gusts and quarter size hail. Hail damage to vehicles is expected. Expect wind damage to roofs, siding, and trees. 5/5/2017 6:28 AM EDT At 627 am edt, a severe thunderstorm capable of producing a tornado was located 10 miles northwest of maysville, or 15 miles northeast of half moon, moving north at 45 mph (radar indicated rotation). Hazards include tornado. Flying debris will be dangerous to those caught without shelter. mobile homes will be damaged or destroyed. damage to roofs, windows, and vehicles will occur. Tree damage is likely. 5/5/2017 6:14 AM EDT At 614 am edt, a severe thunderstorm capable of producing a tornado was located near half moon, moving north at 45 mph (radar indicated rotation). Hazards include tornado. Flying debris will be dangerous to those caught without shelter. mobile homes will be damaged or destroyed. damage to roofs, windows, and vehicles will occur. tree damage is likely. Locations impacted include, richlands, pollocksville and trenton. 5/5/2017 6:08 AM EDT At 608 am edt, a severe thunderstorm capable of producing a tornado was located over half moon, moving north at 40 mph (radar indicated rotation). Hazards include tornado. Flying debris will be dangerous to those caught without shelter. mobile homes will be damaged or destroyed. damage to roofs, windows, and vehicles will occur. tree damage is likely. Locations impacted include, jacksonville, new river station, half moon, pumpkin center, camp lejeune center, piney green, richlands south, pollocksville and trenton. 5/5/2017 5:55 AM EDT At 555 am edt, a severe thunderstorm capable of producing a tornado was located over new river station, moving north at 55 mph (radar indicated rotation). Hazards include tornado. Flying debris will be dangerous to those caught without shelter. mobile homes will be damaged or destroyed. damage to roofs, windows, and vehicles will occur. Tree damage is likely. 5/5/2017 5:29 AM EDT At 528 am edt, a severe thunderstorm capable of producing a tornado was located near river bend, or 11 miles southwest of new bern, moving north at 35 mph (radar indicated rotation). Hazards include tornado. Flying debris will be dangerous to those caught without shelter. mobile homes will be damaged or destroyed. damage to roofs, windows, and vehicles will occur. tree damage is likely. 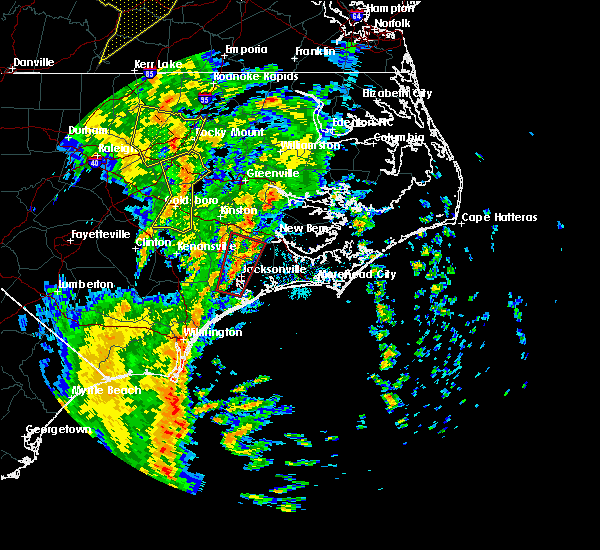 this dangerous storm will be near, vanceboro around 600 am edt. Other locations impacted by this tornadic thunderstorm include trenton, pollocksville and cove city. 3/28/2017 4:46 PM EDT At 446 pm edt, a severe thunderstorm was located near river bend, or 8 miles southwest of new bern, moving east at 30 mph. recently, quarter size hail was reported in trenton, jones county (public). Hazards include 60 mph wind gusts and quarter size hail. Hail damage to vehicles is expected. expect wind damage to roofs, siding, and trees. Locations impacted include, new bern, river bend, pollocksville and trenton. 3/28/2017 4:42 PM EDT At 446 pm edt, a severe thunderstorm was located near river bend, or 8 miles southwest of new bern, moving east at 30 mph. recently, quarter size hail was reported in trenton, jones county (public). Hazards include 60 mph wind gusts and quarter size hail. Hail damage to vehicles is expected. expect wind damage to roofs, siding, and trees. Locations impacted include, new bern, river bend, pollocksville and trenton. 3/28/2017 4:27 PM EDT At 426 pm edt, a severe thunderstorm was located 13 miles west of river bend, or 16 miles southeast of kinston, moving east at 30 mph (radar indicated). Hazards include 60 mph wind gusts and quarter size hail. Hail damage to vehicles is expected. expect wind damage to roofs, siding, and trees. Locations impacted include, new bern, river bend, cove city, pollocksville and trenton. 8/18/2016 3:19 PM EDT At 319 pm edt, a severe thunderstorm was located near maysville, or 12 miles north of pumpkin center, moving east at 30 mph (radar indicated). Hazards include 60 to 70 mph wind gusts. Expect considerable tree damage. damage is likely to mobile homes, roofs, and outbuildings. Locations impacted include, maysville, pollocksville. 8/18/2016 3:03 PM EDT At 302 pm edt, a severe thunderstorm was located 8 miles northeast of richlands, or 11 miles north of half moon, moving east at 30 mph (radar indicated). Hazards include 60 mph wind gusts and penny size hail. Expect damage to roofs. siding. And trees. 7/8/2016 10:14 PM EDT At 1012 pm edt, severe thunderstorms were located along a line extending from 7 miles east of swan quarter ferry terminal to near neuse forest to 8 miles north of richlands, moving southeast at 45 mph. 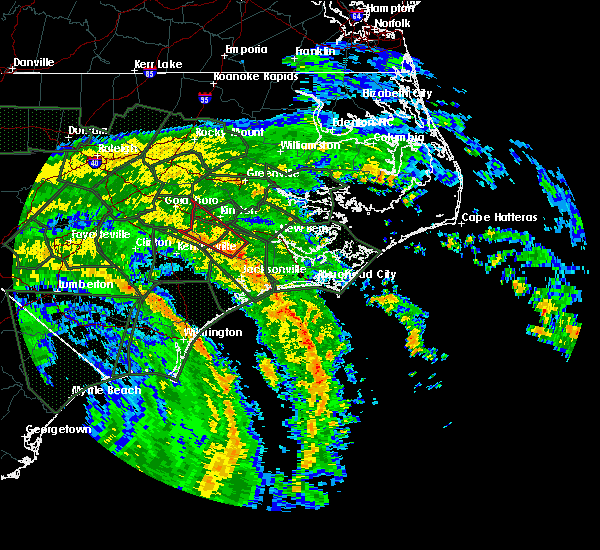 a gust to 58 mph was recorded at the the coastal carolina regional airport in new bern (radar indicated). Hazards include 60 mph wind gusts. Expect damage to roofs. siding. and trees. Locations impacted include, jacksonville, new bern, havelock, morehead city, newport, wallace, warsaw, camp lejeune center, pumpkin center, half moon, new river station, piney green, james city, mount olive, trent woods, river bend, swansboro, cape carteret, rose hill and richlands. 7/8/2016 9:41 PM EDT At 940 pm edt, severe thunderstorms were located along a line extending from 8 miles east of belhaven to 7 miles northwest of new bern to 6 miles south of walnut creek, moving southeast at 40 mph (radar indicated). Hazards include 60 mph wind gusts. Expect damage to roofs. siding. And trees. 7/8/2016 9:33 PM EDT At 932 pm edt, severe thunderstorms were located along a line extending from near belhaven to 6 miles north of vanceboro to kinston, moving southeast at 40 mph (law enforcement). Hazards include 60 mph wind gusts. Expect damage to roofs. siding. and trees. Locations impacted include, greenville, jacksonville, new bern, kinston, washington, winterville, ayden, la grange, half moon, river road, james city, trent woods, river bend, grifton, belhaven, snow hill, richlands, maysville, vanceboro and kinston regional jetport. 7/8/2016 9:16 PM EDT At 915 pm edt, severe thunderstorms were located along a line extending from 11 miles south of plymouth to near winterville to 6 miles west of snow hill, moving southeast at 40 mph (radar indicated). Hazards include 60 mph wind gusts. Expect damage to roofs. siding. and trees. Locations impacted include, greenville, jacksonville, new bern, kinston, washington, winterville, williamston, ayden, farmville, la grange, river road, half moon, james city, trent woods, river bend, grifton, belhaven, snow hill, richlands and robersonville. 7/8/2016 8:50 PM EDT At 849 pm edt, severe thunderstorms were located along a line extending from 6 miles north of robersonville to 6 miles west of pitt greenville airport to near goldsboro, moving southeast at 45 mph (radar indicated). Hazards include 60 mph wind gusts. Expect damage to roofs. siding. And trees. 7/7/2016 9:09 PM EDT At 908 pm edt, severe thunderstorms were located along a line extending from near winterville to 8 miles west of vanceboro to 8 miles northeast of richlands, moving east at 45 mph (radar indicated). Hazards include 60 mph wind gusts. Expect damage to roofs. siding. and trees. Locations impacted include, greenville, new bern, winterville, ayden, james city, trent woods, river bend, grifton, vanceboro, pitt greenville airport, dowdy ficklen stadium, east carolina university, coastal carolina regional airport, bridgeton, grimesland, simpson, cove city, pollocksville and trenton. 7/7/2016 8:57 PM EDT At 856 pm edt, severe thunderstorms were located along a line extending from near farmville to 8 miles south of grifton to near richlands, moving east at 45 mph (radar indicated). Hazards include 60 mph wind gusts. Expect damage to roofs. siding. and trees. Locations impacted include, greenville, new bern, winterville, ayden, farmville, james city, trent woods, river bend, grifton, richlands, vanceboro, east carolina university, coastal carolina regional airport, bridgeton, grimesland, simpson, hookerton and dover. 7/7/2016 8:46 PM EDT At 845 pm edt, severe thunderstorms were located along a line extending from near snow hill to near kinston to near richlands, moving east at 45 mph (radar indicated). Hazards include 60 mph wind gusts. Expect damage to roofs. siding. and trees. Locations impacted include, greenville, new bern, kinston, winterville, ayden, farmville, la grange, james city, trent woods, river bend, grifton, snow hill, richlands, maysville, vanceboro, east carolina university and coastal carolina regional airport. 7/7/2016 8:32 PM EDT At 831 pm edt, severe thunderstorms were located along a line extending from near goldsboro to 9 miles south of la grange to near beulaville, moving east at 40 mph (radar indicated). Hazards include 60 mph wind gusts and nickel size hail. Expect damage to roofs. siding. And trees. 7/7/2016 6:43 PM EDT At 642 pm edt, severe thunderstorms were located along a line extending from 7 miles southwest of washington to 6 miles southeast of vanceboro to 7 miles west of river bend to near richlands, moving east at 40 mph (radar indicated). Hazards include 60 mph wind gusts. Expect damage to roofs. siding. and trees. Locations impacted include, new bern, washington, river road, trent woods, river bend, richlands, vanceboro, goose creek state park, coastal carolina regional airport, richlands south, chocowinity, bridgeton, washington park, pollocksville and trenton. 7/7/2016 6:31 PM EDT At 630 pm edt, severe thunderstorms were located along a line extending from 9 miles southeast of winterville to near vanceboro to 13 miles northwest of maysville to near richlands, moving east at 45 mph (radar indicated). Hazards include 60 mph wind gusts. Expect damage to roofs. siding. and trees. Locations impacted include, greenville, new bern, washington, winterville, ayden, river road, trent woods, river bend, richlands, beulaville, vanceboro, goose creek state park, coastal carolina regional airport, richlands south, chocowinity, bridgeton, washington park, grimesland, simpson and cove city. 7/7/2016 6:18 PM EDT At 617 pm edt, severe thunderstorms were located along a line extending from ayden to near grifton to 11 miles south of kinston to near beulaville, moving east at 40 mph (radar indicated). Hazards include 60 mph wind gusts. Expect damage to roofs. siding. And trees. 5/3/2016 6:46 AM EDT At 646 am edt, a severe thunderstorm was located near maysville, or 13 miles southwest of new bern, moving east at 45 mph (radar indicated). Hazards include 60 mph wind gusts. Expect damage to roofs. Siding and trees. 2/16/2016 7:53 AM EST At 751 am est, emergency management reported a line of severe thunderstorms producing trees down near deep run. these storms were located along a line extending from near snow hill to kinston to near albert j ellis airport, moving northeast at 50 mph. locations impacted include, jacksonville, kinston, la grange, half moon, piney green, pumpkin center, grifton, snow hill, richlands, richlands south, albert j ellis airport, kinston regional jetport, pink hill, hookerton and trenton. 2/16/2016 7:30 AM EST At 729 am est, doppler radar indicated a line of severe thunderstorms capable of producing damaging winds in excess of 60 mph. these storms were located along a line extending from near walnut creek to near beulaville to near murray town, and moving northeast at 45 mph. 7/21/2015 9:53 PM EDT At 952 pm edt, doppler radar indicated a severe thunderstorm capable of producing damaging winds in excess of 60 mph. this storm was located 7 miles northwest of maysville, or 10 miles northeast of half moon, moving east at 45 mph. in addition, numerous trees down have been reported across duplin county. locations impacted include, jacksonville, half moon, pumpkin center, richlands, maysville, richlands south, pollocksville and trenton. 7/21/2015 9:29 PM EDT At 929 pm edt, doppler radar indicated a severe thunderstorm capable of producing damaging winds in excess of 60 mph. this storm was located 7 miles northeast of beulaville, or 15 miles northwest of half moon, and moving east at 45 mph. 6/27/2015 10:50 PM EDT At 1049 pm edt, doppler radar indicated a severe thunderstorm producing damaging winds in excess of 60 mph. this storm was located near richlands, or 8 miles north of half moon, moving east at 40 mph. locations impacted include, new bern, river bend, richlands, pollocksville and trenton. 6/27/2015 10:36 PM EDT At 1036 pm edt, doppler radar indicated a severe thunderstorm capable of producing damaging winds in excess of 60 mph. this storm was located near beulaville, or 15 miles northwest of half moon, and moving east at 35 mph. 6/26/2015 5:25 PM EDT At 524 pm edt, doppler radar indicated a severe thunderstorm capable of producing quarter size hail and damaging winds in excess of 60 mph. 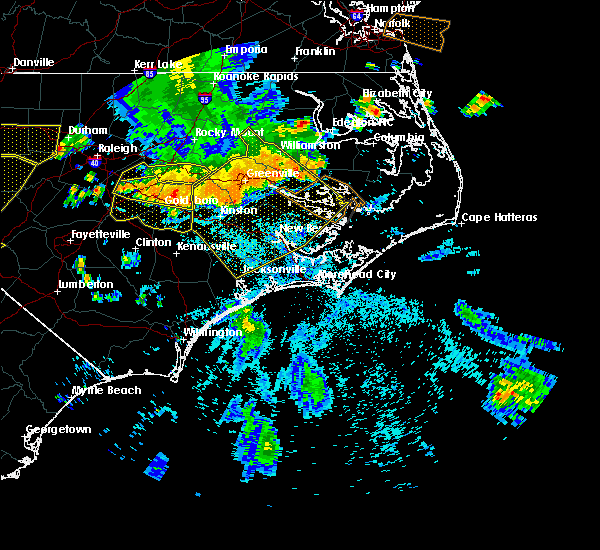 this storm was located over vanceboro, or 13 miles northwest of new bern, and moving east at 10 mph. 6/26/2015 5:17 PM EDT At 516 pm edt, local law enforcement reported a severe thunderstorm producing quarter size hail. this storm was located 5 miles northwest of trenton, moving east at 10 mph. locations impacted include, dover, cove city and trenton. 6/26/2015 5:08 PM EDT Quarter sized hail reported 5.7 miles SE of Trenton, NC, quarter-size hail reported on wyse fork road. 6/26/2015 4:58 PM EDT At 457 pm edt, doppler radar indicated a severe thunderstorm capable of producing quarter size hail and damaging winds in excess of 60 mph. this storm was located 13 miles southeast of kinston, moving east at 10 mph. locations impacted include, dover, cove city and trenton. 6/26/2015 4:36 PM EDT At 435 pm edt, doppler radar indicated a severe thunderstorm capable of producing quarter size hail and damaging winds in excess of 60 mph. this storm was located 10 miles southeast of kinston, and moving east at 15 mph. 5/21/2015 4:53 PM EDT At 452 pm edt, doppler radar indicated a line of severe thunderstorms capable of producing quarter size hail and damaging winds in excess of 60 mph. these storms were located along a line extending from 13 miles south of kinston to near richlands to white stocking, moving east at 30 mph. locations impacted include, jacksonville, new bern, piney green, half moon, pumpkin center, camp lejeune center, new river station, trent woods, river bend, richlands, maysville, albert j ellis airport, richlands south, sneads ferry, holly ridge, pollocksville and trenton. 5/21/2015 4:27 PM EDT At 426 pm edt, doppler radar indicated a line of severe thunderstorms capable of producing quarter size hail and damaging winds in excess of 60 mph. these storms were located along a line extending from 14 miles southwest of kinston to beulaville to near wards corner, and moving east at 25 mph.